The Kingsbury Hotel, Colombo, The premier five star hotel in the leisure sector of Hayleys PLC recently provided the gift of knowledge to over 40 children in the Pamunugama Child Development Centre. 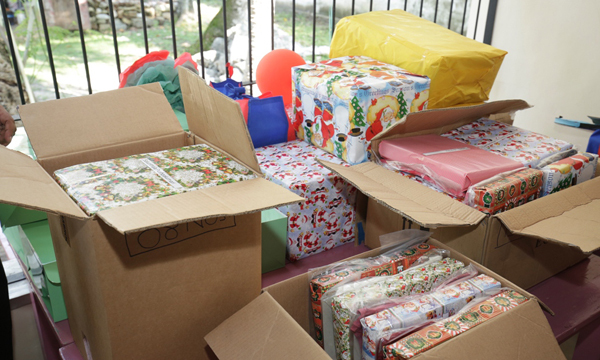 The children were present during the Christmas tree lighting of the hotel and subsequently received a donation of over 400 children’s books, seasonal goodies and other stationary supplies. “As part of our CSR arm Kingsbury Nurtures, this project is dear to us as we wanted to give back to those who need it the most. We set up a collection box in the hotel premises during December and invited our guests to be a part of this notable venture. We strongly feel that by providing children with the necessary tools today, we can ensure that they will have a brighter tomorrow as they will be in a position to improve the well-being for themselves as well as their communities”, remarked Christine Chevalaz, General Manager of The Kingsbury Hotel, Colombo. The Kingsbury Hotel is located in the heart of Colombo featuring stunning views of Sri Lanka’s iconic Galleface Green. The hotel boasts a collection of varied cuisine from its outlets – The Kings, Yue Chuan, Harbour Court, Honey Beach Club, The Gourmet Station, The Grill and The Ocean. Since its inception, The Kingsbury Hotel, Colombo has consistently catered to the diverse needs of customers. As the newest offering, the award winning Singaporean dining and entertainment brand CÉ LA VI takes entertainment and nightlife to a new pinnacle. The Kingsbury has earned global accolades including Regional Winner Luxury Business Hotel in South Asia and Best Luxury Business Hotel in Sri Lanka.